I received an invite to their Chef’s table, billed as a four-course meal paired with cocktails, with chef Jason Donoho and mixologist Bill Norris. It was $100 per person, and though I really wanted to go, I wasn’t sure I was ready to dish out that much cash. Then I looked at the menu. And voila! We dined at the chef’s table tonight. There were 13 of us around the large table in the dining room, and many of us had never met before. It reminded me of a Dai Due dinner… strangers gathered ’round a table, connected by their love of great food and drinks. We then moseyed inside to our table, where we were brought some nibbles… a plate of farm watermelon and crispy prosciutto. 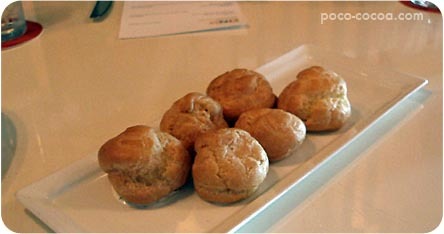 And profiteroles filled with lemon-dill yogurt. Profiteroles! With savory yogurt filling! Who knew?! 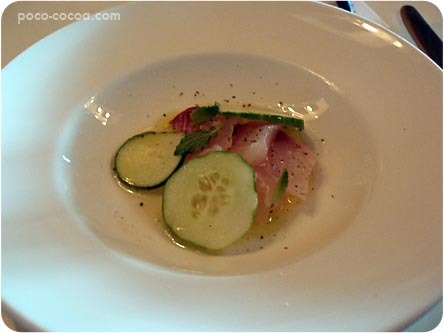 And it paired perfectly with the first course of Gulf Snapper Crudo… raw snapper, cucumber, yuzu and green tea salt. 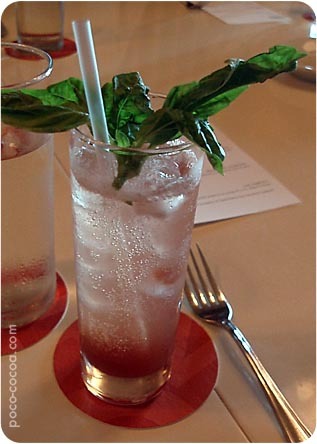 Next we had the Gin Provencal… made with Hendricks gin, heirloom tomatoes, basil, creme de cassis and sparkling mineral water. This tasted like a sparkling garden. 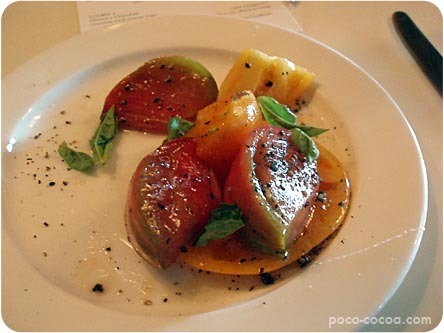 It went perfectly with the heirloom tomato salad with juniper vinaigrette. The vinaigrette was made with Hendricks gin and juniper, reduced down and mixed with olive oil. The tomatoes were so sweet, the vinaigrette perfectly salty. 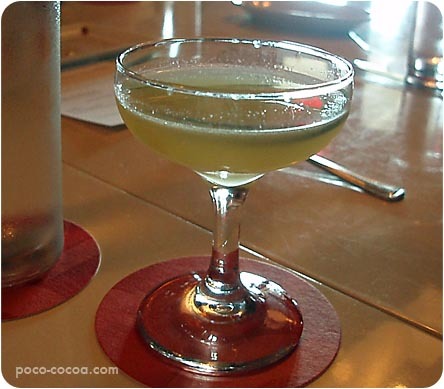 Bill surprised us next with an off-the-menu drink… a St. Croix Crusta. 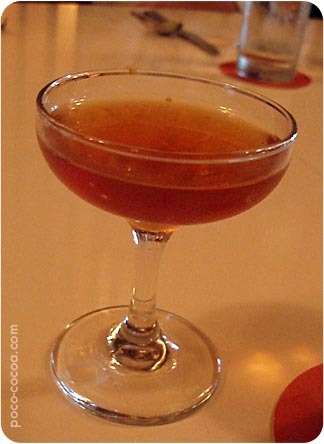 The recipe came from an 1880’s bartender’s handbook that called for orchard syrup and St. Croix rum. Bill made his version with Orinoco rum aged in chestnut barrels, maple syrup, lemon juice, maraschino liqueur, lemon peel, bitters, and a sugar-crusted rim. 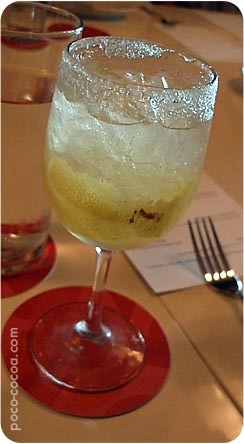 The drink had an amazing bruleed-lemon flavor. 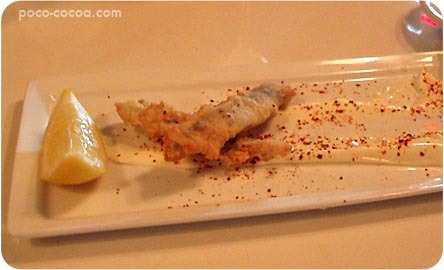 With this, we also got a surprise plate of fried white anchovies and aioli. Perfection. The next drink was called “Breakfast of Champions,” and featured bacon-infused Corner Creek reserve bourbon, amaro nonino, orange zest and pecan syrup. Bacon in a beverage… so good. 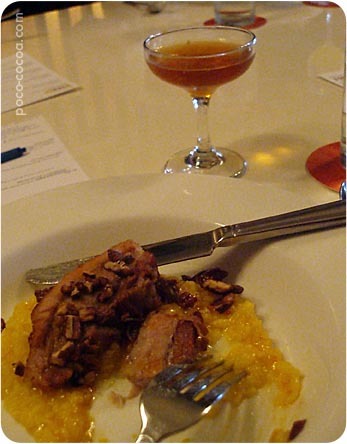 It was served with pork belly confit with saffron honey, bomba orange risotto and candied pecans. I mean, really, can pork belly ever be bad? The answer is no, my friends. Finally, we made it to dessert. Oh, dessert. We started with a Cafe Correcto… house decaf espresso grappa, Ron Zacapa 23 year rum, allspice syrup and freshly grated nutmeg. Sweet and deep with coffee flavor. The dessert… oh, the dessert. I’m finding it hard to write about the dessert without swooning. 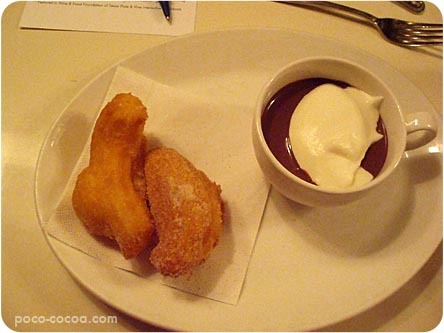 Freshly fried churros dusted with orange sugar, and the most perfect cup of chocolate ever. It was like a cold liquid chocolate mousse, or melted chocolate ice cream, or a chocolate pot de creme that hasn’t quite set up yet. I could have eaten this all night. I could eat this for the rest of my life and be happy. And after all that perfection, Bill STILL brought out more… tiny glasses of preserved cherry liqueur, sweet and perfect, cooked down with cinnamon, lemon juice and lemon peel. We sipped a bit of coffee after dinner, chatted with our tablemates, and marveled at how lucky we are to have this kind of food and these great cocktails so close to home. The lesson to be learned here? If you get an invitation from Fino, accept it. Immediately. OK, that does look absolutely amazing! So many drinks! 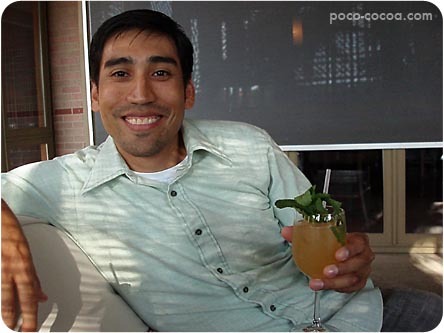 I hope some of these are on the cocktail menu there, since I’m really angling to try them out. Rachel–the cafe correcto is on the dessert menu, the others aren’t currrently on the menu, but I put The Liberdade on the menu at Annie’s. If you come by on a slow night, I’ll see what I can do. if you are into great tasting menus you should definitely check out our supper club. Our next event is on August 4th at the Allan House downtown. The menu is listed on our website (www.royalfig.com) and it’s only $69 for 5 courses with wine and drink pairings. I’ve been following your blog so please check ours out too!